The new exhibition in Colyer-Fergusson Gallery explores a new version of ‘Hansel and Gretel’ ahead of a performance of a new chamber work coming to the concert hall on Sunday 21 October. The artwork by Clive Hicks-Jenkins and Phil Cooper reflects the visual imagery created for the performance in both developmental stages in the creation of the set and animation, as well as the figures of Hansel and Gretel themselves. 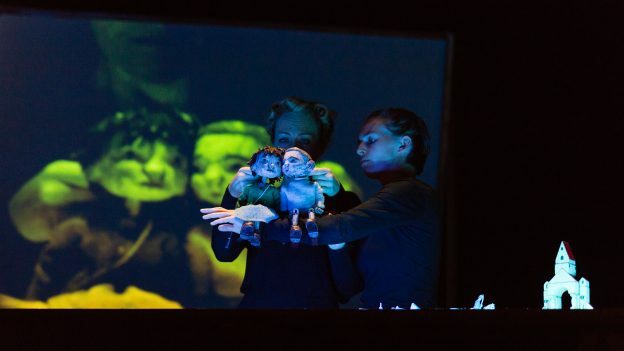 Some of the work features in the performance itself, a unique blend of live music, animation, puppetry and narration, with words by the poet Simon Armitage and music by Matthew Kaner, former Embedded Composer with BBC Radio 3 and Professor of Composition at the Guildhall School of Music and Drama. The touring performance comes to Colyer-Fergusson in partnership with this year’s Canterbury Festival, and the event on campus is the only instance of the formative artwork being exhibited. The exhibition, on display until 26 October, is open during normal working hours including weekends, and there is disabled access; admission is free. This entry was posted in Campus online, Medway Student, Student Guide on 8 October 2018 by Annabel Chislett.